In the first part of our interview with Kelly Palmer and David Blake, authors of the new book The Expertise Economy, we discussed nontraditional ways for people to develop necessary workforce skills, both inside and outside of university settings. In the second part, we explore how companies can create cultures of learning and continue developing their employees’ skills. Why is it important for organizations to offer personalized learning? What does personalized learning look like? David: Today, I came from a large organization that was struggling with the challenge of internal mobility inside their organization. Historically, they’ve had career pathing, but it looked like the subway map that many organizations have. But the reality is that our world is becoming more personalized and more specialized. It looks more like a web where, with the right skills, you can ask, “Where else inside the organization would those skills be most leveraged?” That could send you off in any number of directions. How your personal skills map to those opportunities inside the organization is unique to you, because even someone with your same job title who sits to your left or your right will have different combinations of skills at different levels that might send them off to different places. As you start to add that up, you get too many combinations to then be able to support it. You’re no longer able to say, “If you go left, do this; if you go right, do this” when there are infinite combinations. It’s beyond the ability of an organization to develop programming to support that. You have to then use technology to enable the personalization of that person’s learning. If every person inside the company has ambitions and a unique combination of skills, only with technology can you provide that person a unique, powerful set of development opportunities that map directly to that combination of who they are and what they want to become. What companies are best-in-class when it comes to offering learning to their employees? How has this become a competitive advantage in terms of attracting and retaining talent? Kelly: The most forward-thinking companies are taking a whole new mindset in how they think about learning. Some examples include Unilever, Bank of America, Mastercard, and Airbnb. Instead of having a command-and-control model in which the company pushes training to people, they’re starting by creating a culture of learning, letting people know that they support their learning and development, and that they want to encourage employees to be continuously learning and building skills. It may sound really simple, but that’s really where it needs to start. We know that the rate of change is faster than at any other time in history. As David was mentioning before, the realities of digitization and automation in the world of work means that we need to think about learning differently. These best-in-class companies are helping people learn in the flow of work, rather than taking people out of their work and into a classroom and expecting them to come back and hopefully be able to apply those skills. They’re providing learning in the time of need, while they’re in the flow of work. They’re also broadening what the actual definition of learning is. It’s not just classroom learning or e-learning; it includes podcasts, videos, books, articles, TED talks. By broadening what learning actually is, they’re saying that you should actually learn whatever you need to be learning. We also know that one of the biggest drivers of employee engagement is when employees have the ability to learn and grow in their careers. If companies have this new mindset, they’re saying that they’re investing in people and in their future. That’s not only good for the employee, it’s great for the company. This is how learning and building skills becomes a competitive advantage. If people feel like they’re being invested in, and that they can grow and learn in their careers, they will want to work for your company. Today, people actually choose companies that they know truly invest in their employees. Companies, in return, will have employees who are building new skills and will set the company up for future success. What strategies do you suggest for combating content overload? David: With Degreed, we have some power users, people who learn at the rate of 10 times the normal self-taught learner. It’s been interesting to see how some of those people learn. For instance, they’re able to give process and structure to their informal, lifelong learning. What we don’t appreciate at the university level is the enormous amount of curation that is happening for our benefit. You have the dean deciding the program and which courses you put together, you have professors deciding the syllabi and what text and information should fit together. They have to read a lot of things to filter and sort and get that delivered to us. The reality is that in an Internet world, we’re swimming through all of this information. It’s not especially efficient, and it’s not always very effective. Developing that skill of being deliberate, being intentional, and curating your own learning by finding sources, creating a process by which you subscribe, filter, and follow goes a really long way toward cutting through the noise. The last thing I would add is to have a goal. If you are just wandering or swimming, it’s far less intentional than if you know what you’re trying to accomplish. If you have that formal education, you know you need to graduate, you need a major, you have some courses you need to take, and you just work through it. We don’t have that in informal lifelong learning. But you can create that for yourself. Set a goal; that helps you decide what is worthwhile, what isn’t, and how you should spend your time. It makes a big difference, and not a lot of people have that personal learning objective. What is the value of peer learning? How can organizations help foster peer learning? Kelly: Going back to the rate of change that we’re currently experiencing, peer-to-peer learning is going to be more important than ever in companies. I love this quote from John Hagel, who writes about scalable learning: “Scalable learning is the power of harnessing a large network of peers to learn faster than we could ever hope to learn on our own.” In Expertise Economy, we talk about the power of peers and the fact that companies don’t typically take advantage of all the expertise that’s already in our companies. So how do we do that? One of the main things people need to think about is the shift in thinking to use teams to solve real work problems. Instead of taking people out of work to see if they can apply things back on the job, actually present a real work problem to a team and have them solve it together. That’s a great learning opportunity. In the book, we write about Intrepid Learning, a great corporate MOOC [massive open online course] platform for helping teams embrace a learning environment. We also write about Degreed in the book, which is a learning experience and skills-building platform that companies can use for peer-to-peer learning and have people help their colleagues learn by recommending content. Also, people can get a view into what their peers are learning and what skills they have mastered for their roles. As David was mentioning earlier with curated content, there’s this huge power that exists in a central L&D function that curates all the content for an entire company. But, you should also think about how many experts you have in your company, and have those experts create curated content on the best ways to learn their areas of expertise. One of the advantages of that is you get everyone involved in the learning process. Instead of having just a few people pushing out content, you’ve got the whole organization involved in learning, which creates a learning culture. One thing that’s really powerful about peer-to-peer learning is the harnessing of data and analytics, and getting insight into what knowledge is being created and what skills peers already have and what skills they’re building. That data can be used in a variety of ways to help your organization think about career mobility and where there are opportunities for growth and stretch assignments. Another thing that’s interesting about peer-to-peer learning is how we can help people become comfortable with giving and receiving peer feedback. In the book, we talk about how in a working environment, people need to be brave enough to share their thoughts with peers. It’s hard to give honest feedback, so there are some skills to be learned in peer-to-peer learning. People need to feel that they can give honest feedback rather than just telling people what they want to hear. People also need to be open and vulnerable enough to accept constructive input. Receiving feedback is about keeping an open mind and appreciating that the other person is taking the time to think about how you can do something better. Ideally, feedback would be perceived as a generous gesture to be met with gratitude. How can focusing on experience help foster work-life balance, or make it easier for people with family obligations to be part of the workforce? Are there other types of job applicants who are often overlooked, and who might benefit from the focus on experience over traditional education? When you talk about work-life balance, you have to trust people to empower them to make their own work-life balance decisions and trade-offs. The important thing is to be clear about what the objective and the mission of learning is . . . why we are learning, and when we are learning. It’s true in the larger sense of the workforce, as well. If the mission of what you want to accomplish and the vision of what it looks like in progress is true within the organization, that enables people to identify where their own personal mission overlaps. If you can trust people and empower them to make the trade-offs in their lives to allow them to achieve that the mission in the most efficient way for them, that’s really powerful. There are a lot of shifts going on in the future of work where we have to ask ourselves: Have we really created clear objectives? Are we clear in our vision and our mission? Do we trust and empower people? Kelly: I’d add that I love the book The Hundred Year Life by Lynda Gratton and Andrew Scott, which talks about rethinking the notion of our “work life.” The old model is that the first part of our lives is all about education, the second part is all about working and family, and the third stage is when we’re expecting people to retire. We know now that people are working longer, not just because they have to but because they want to. Our life spans are longer. When you think about how the three-stage traditional lifespan is changing, and that we’re not really staying at one company our whole careers, or that we’re in more of a career lattice than a career ladder, it’s easy to see the point David made earlier that there are certain times where you can give your all to your career, and other times where you need to step back and take care of some more personal things like kids or elderly parents. The idea is that you can step in and out of the career lattice as time permits. You can also think about the stage of life between 65 and 80 not necessarily as the time of retirement, but as a time when you can add a lot of value. Companies, I think, have this obsession with Millennials, but there’s this whole range of people who want to keep working and have a lot to offer. Not only that, but they want to keep learning, they want to grow and develop these skills and do different things. If companies would tap into this mindset and that segment of the population more, it could really benefit employees and companies alike. 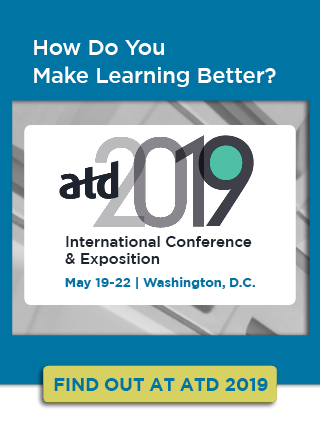 Be sure to join David and Kelly February 7 at ATD 2019 TechKnowledge. Their session will include the latest scientific research on how people really learn and concrete examples from companies worldwide who are driving the conversation about how to create experts and align learning innovation with business strategy. Interesting article, especially the connection you make between employee engagement and learning.